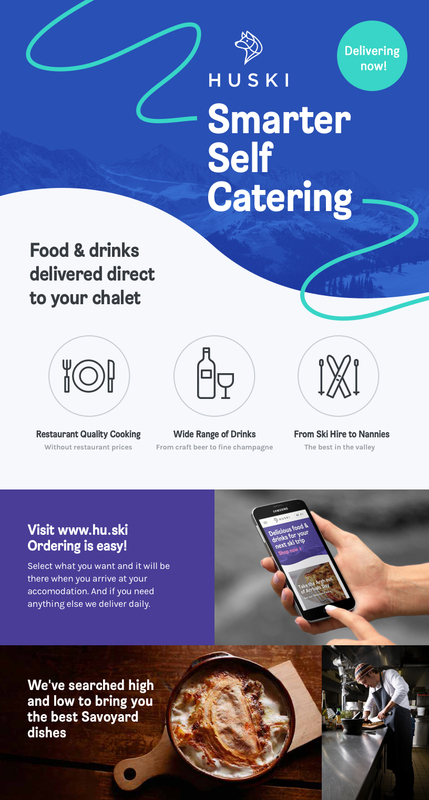 Huski is an online food, drink and concierge service for skiers in the French Alps. Huski is designed for people who self-cater and would rather not cook/shop/clean-up, but also don't want to pay exorbitant restaurant prices every night. They deliver daily meals both from locally sourced restaurants and a selection of frozen ready meals from the UK's Cook Food. This is the first time Cook’s food has been available outside the UK. They will also deliver from a full range of drinks, and offer a directory of approved services like teachers, guides, masseurs and in-chalet ski rental. And they'll also be great value. Roughly 30% and upwards cheaper than anything else you'll find in the resort. This year is their test season - where they will be delivering in the Tarentaise Valley - Les Arcs, Tignes, Val D'Isere, St Foy and La Rosiere, with their HQ in Bourg Saint Maurice. They then plan to seek funding in the Spring for a full pan-Alps push in seasons 2, 3 and 4. We think it's a great offer for those who want the kind of easy, tasty and low cost service that you get in the city to people staying in the mountains.